Due to some items being limited in availability, please email us prior to placing an order. (around 4kgs or 10lbs), is a full height with attractive design. The Rose uses the dependable scotch tension for smooth and easy spinning. The Aura is here! A new way of looking at double drives and a new way of looking at spinning. This wheel is a collaboration between Majacraft and the very accomplished spinner Pluckyfluff. in spinning then come and spend time with an Aura. anything that can be pulled through this orifice! to keep the spinning head away from the pedals when you fold it down. April 2010. 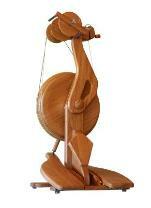 There are three jumbo wooden bobbins included with the Aura. 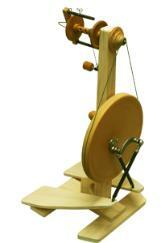 your existing Majacraft spinning wheel into a production style wheel. to fit your style and body. by it’s owner. If you want to start spinning with Majacraft then the Pioneer is the wheel for you! We also offer all Majacraft accessories... e-mail for details and pricing!